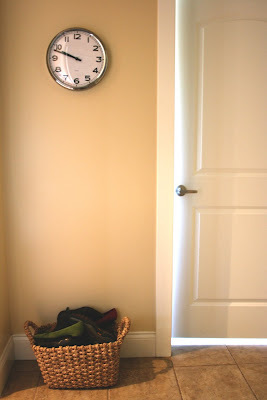 Once upon a time after looking at a layout like this (see above), I decided to embark upon a mini makeover in my own mudroom. I realized that coming home to a tidy space would be far less overwhelming than walking into what appeared to be a mini-landfill. Although some days this room slowly reverts back to its landfill-roots, we (I) try to keep it relatively junk-free. of the kids' little jobs is to return the shoes to their rightful closets. are a little more hectic around here these days needless to say! 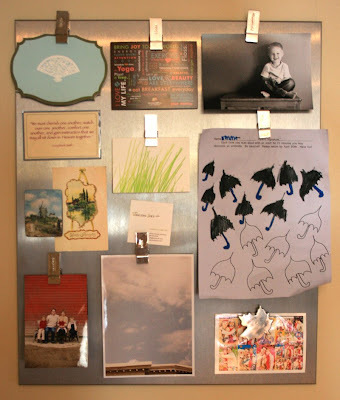 I use these galvanized steel bins from IKEA to store gloves, hats, umbrellas, etc. grass-covered letter press card from Marilyn I received in the Spring Swap. Beautiful and Inspiring! That is a room that I need to tackle. Especially after winter!! wow, that room looks GREAT, stephanie! you are so CLEAN!! I really love the metal accents! In the inspiration photo, the window with topiary is so fresh looking! Wow! It looks very neat! I was very motivated to do some makeovers at our house. I especially like the stainless board. You've inspired me once again. I've had the mudroom in the back of my mind for ages. Time to get going on it. Mark and I were just discussing our mud room this morning. Figuring out flooring and benches and such. I love the idea of a clock!!! Perfect addition for sure! 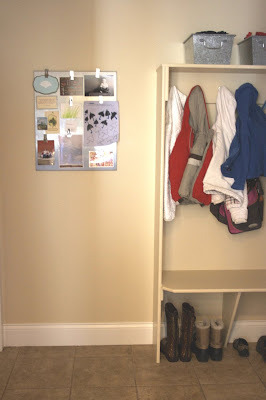 In my dreams my mudroom looks like those pictures, but even with cubbies for each family member and plenty of hooks for the backpacks and jackets, it never seems to look the way I want. I need to put my foot down and demand that the room look like this. I think I will print off that first picture to inspire my family to try harder to pick up after themselves. I can definitely relate to the landfill reference you made. Thanks, once again for the inspiration and for the shout out! That room looks neat! Love it.